For seasoned observers of Venezuelan politics, the events of the past week are a disheartening repetition of opposition-led resistance efforts that have yet again sought to undermine political stability in the country. This is not the first time in recent history that the opposition has resorted to “extra-parliamentary” tactics, including violence, to push their political agenda. Nor is it the first time that the mainstream media has provided generous airtime to opposition demonstrations in Caracas, repeating the sob stories of upper class Venezuelans “repressed” by the government because they cannot find toilet paper on the store shelves, or in a more laughable episode, ingredients to bake a cake.As with most situations in which there has been a violent conflict over who controls the reins of the state, it is possible to find fault on both sides. As a February 22nd report by the Centre for Economic Policy Research notes, “the political allegiances” of the victims of the violence so far “and their causes of death are varied.” Of the eight deaths, two of the responsible assailants might be linked to the government, including a SEBIM agent (the Venezuelan intelligence service) who was not authorized to be at the protest. The head of SEBIM was subsequently fired and there is a warrant out for arrest of the agents who fired the shots. Over the last few weeks, the functional role of the privately-owned media viewable in Venezuela, such as the Colombian television station NTN24 which also broadcasts in Colombia, and CNN en Español, based in the U.S., has been to promote and consolidate a matrix of opinion and interpretation around the recent events in Venezuela: “peaceful protests” have been lined up against “excessive use of force by state security apparatuses.” This frame has found its echo in virtually all of the presidential or prime ministerial statements on the recent conflicts in Venezuela issued by Western imperialist states over the last number of days. For example, on February 21, 2014 U.S. Secretary of State John Kerry predictably called for an end to violence “on both sides,” criticizing the Venezuelan government for imprisoning “students and a key opposition figure” as well as limiting “the freedoms of expression and assembly necessary for legitimate political debate,” such as revoking the credentials of CNN en Español reporters. A closer inspection reveals, however, that the situation is less two-sided, to put it mildly, than Kerry and his spokespeople in the mainstream media would have us believe. Indeed, this February the counter-revolutionary forces have once again demonstrated blatant disregard for the basic principles of liberal democracy to which they theoretically subscribe. One of the reasons that it is easy to defeat the opposition’s claims in Venezuela (at least in rational argument) is that their attempts to manufacture consent are largely based upon a series of half-truths, lies and misdemeanors. Unfortunately these misdeeds are continually parroted in the mainstream press as if they were true with no apparent need for fact-checking. For example, on February 20, The New York Times , reported that “The only television station that regularly broadcast voices critical of the government was sold last year, and the new owners have softened its news coverage.” This is an outright lie according to the Carter Centre, which reported in 2013 that private TV media has about 74 per cent of the audience share for news, with the state share at just 26 per cent, for “recent key newsworthy events.” While withering budgets for investigative journalism might be to blame for some of this inaccuracy in reporting, it is more likely that the corporate media shares the opposition’s vision of “democracy.” In such a vision, any attempt to redistribute a mere fraction of the social wealth in a way that curtails the “freedom” to accumulate capital is a threat to social justice. As John Kerry lambasts the Nicolás Maduro government, “This is not how democracies behave,” referring to the imprisonment of some instigators of the protests. By way of context and juxtaposition, on February 12, 30 students were arrested in Venezuela in the wake of barricade building, Molotov cocktail attacks, and tire burning; 7,000 protesters were arrested during the days of Occupy in 122 cities of the United States between 2011 and 2013; and 153 students were arrested in the UK during the 2010 demonstrations against 300 per cent hikes in tuition. This is not even to get into what British journalist Gary Younge has called an “open season on black boys” in the United States by vigilantes, and the propensity for police officers to regularly kill unarmed black men with impunity in that country. The real problem, it seems, is that democracy is supposed to entail competitive elitism and an exchange of office between bourgeois political parties (such as the Republicans and Democrats); it is not supposed to create room for alternative projects whose aim is to reform capitalism, the foundation of liberal democracy itself, by curtailing some of the “freedoms” associated with owning private property, such as controlling the media, buying elections, orchestrating corporate welfare projects, and supporting a foreign policy that keeps the world “free” for accumulation. Where were the mainstream reporters during the post-election violence in April 2013, when a dozen government supporters died at the hand of the opposition? Where were they when the Chavistas swept the municipal elections by a margin of 10 per cent of the popular vote in December 2013? And where have they been every time a landowner has murdered a peasant leader? While opposition supporters complain about the violations of human rights in Venezuela, the supporters of the Bolivarian process talk about the right to information, which is best produced by public and independently controlled and operated community media rather than by the employees of profit-seeking media conglomerates. It is tempting to imagine that there might be some truth in the pro-democracy slogans of the young people coalescing on the streets of Caracas, but the right-wing opposition in Venezuela, of which this student revolt is a part, has a less than stellar record of comporting itself within the constitutional parameters of bourgeois liberalism. They attempted a coup d’état in April 2002, which temporarily removed Chávez from office with the support of the U.S. government. 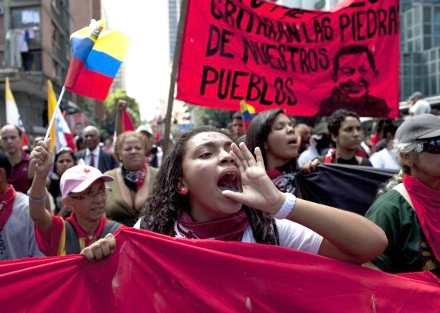 When that avenue closed, and Chávez returned to power with the help of massive demonstrations of public support and military forces loyal to the President, they orchestrated a lockout of the oil industry in late-2002 and early 2003, in an attempt to bleed the economy dry and foment discord among broad swathes of society. That effort soured as well. Indeed, with each lashing of the reactionary whip in these years there was an unintended deepening of self-activity, self-organization, and creativity of popular organizing from below. The opposition logged a new electoral failure when their attempt to recall the President through a referendum in 2004 was defeated. They cried fraud, as they do in each election they lose, despite universal praise of the fairness and transparency of the Venezuelan electoral system from independent international observers. In 2005, the opposition boycotted the National Assembly elections, withdrawing themselves from the electoral game in a misguided hope that the legitimacy of the political system under Chávez would be undermined altogether. Similar to a small child who has lost her temper after losing the game for the umpteenth time in a row, the opposition’s boycott amounted to a tantrum in which the opposition took its ball and went home. And similar to a small child who has become frustrated with playing by the rules, it has resorted to other options when faced with continual defeat: lying, cheating, and challenging the referee. Last April, following the death of Hugo Chávez, presidential elections saw Maduro best Henrique Capriles, the right-wing candidate for the Mesa Unida Democrática (Roundtable for Democratic Unity, MUD), albeit by a narrow margin of less than one per cent of the vote. While this result was too close for many supporters of the Bolivarian revolution who had previously gained comfort from large margins of 10 per cent, it would still count as a landslide victory in a country such as Canada where the Conservative Party formed a majority government in 2009 with only 38 per cent of the popular vote. Predictably, the opposition’s response to yet another electoral defeat was rage. Capriles and his supporters refused to recognize the veracity of the results and then staged violent protests causing the death of a dozen Bolivarian activists, while leaving another hundred or so injured. The violent vandals of last April also committed extensive property damage to public buildings and institutions. It is worth noting, furthermore, that unlike in the case of the recent Honduran elections – widely recognized by mainstream human rights organizations to have been fraudulent, and which further consolidated right-wing strong man Porfirio ‘Pepe’ Lobo’s grip on that country – the U.S. has never formally recognized the legitimacy of Maduro’s presidency. 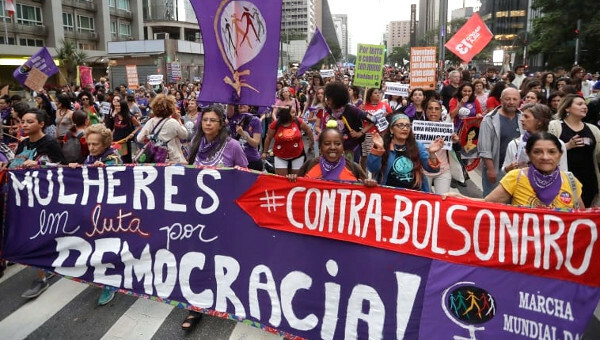 Once it was evident that provocation in the streets following the April elections was failing to destabilize the regime, or to rally new social sectors to the side of the opposition, the latter regrouped and reconsidered its tactics. The MUD held internal elections to establish a new mandate for its leadership. Capriles came out on top once again, beating Leopoldo López and María Corina Machado, two personalities to which we will have occasion to return in a moment. The revised agenda for the Right was to frame the December 2013 municipal elections as a plebiscite on the legitimacy of the Maduro administration. In the municipal elections, Chavismo won decisively, regaining some of the political ground lost in the presidential elections eight months earlier. In spite of a voluntary voting regime and a historical tendency of abstention in local elections, there was a turnout of 60 per cent. Chavismo won by approximately 10 per cent, capturing 242 mayoralties to MUD’s 75. This unanticipated outcome for the opposition signified its failure since April last year to undermine the legitimacy of the Maduro presidency. MUD proved itself incapable of disputing the hegemony of Chavismo in the electoral field, even during a year in which inflation rose very sharply to 56 per cent and shortages of foodstuffs and other basic commodities began to proliferate. Shortly after the results were in, Capriles, now acting as governor of the state of Miranda, changed gears and responded to the second call in the post-municipal election period by President Maduro for opposition mayors and governors to meet with him in the presidential palace and work out a plan of peace and national reconciliation. A photo of Capriles and Maduro shaking hands in the palace was circulated widely in the media, ostensibly ending the Right’s strategy of openly questioning the legitimacy of the constitutional President. Alongside Capriles, the majority of oppositional mayors and governors also attended the dialogues with the President, and agreed to participate in a new program designed to reduce crime and enhance citizen security. 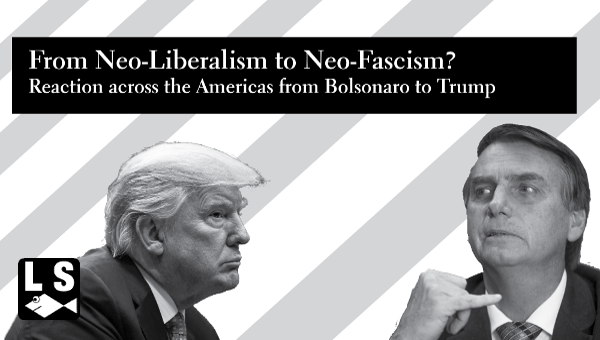 The move toward moderation and dialogue was unpersuasive to the hardest elements of the ultra-Right within the MUD coalition, however, and the recent manoeuvring of López and Machado is in part an expression of this tension internal to the opposition. 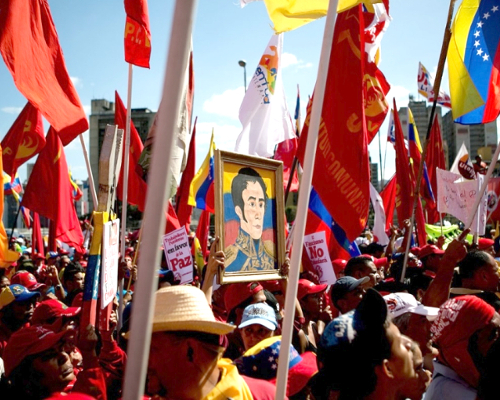 For many on the Left of Chavismo, however, it is easy to exaggerate the divisions within the counter-revolutionary bloc, and in so doing dangerously obscure their basic unity of purpose. 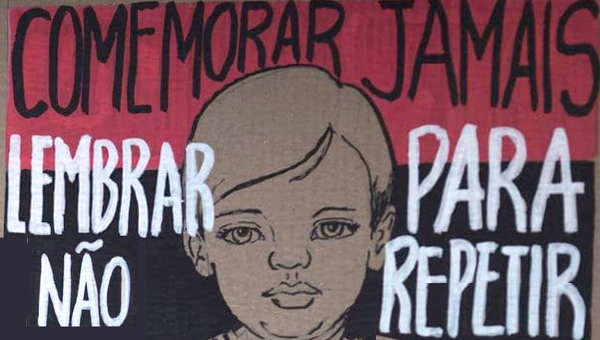 “We are facing the classic counter-revolutionary schema,” reads a recent communiqué of the revolutionary socialist current Marea Socialista (Socialist Tide, MS), which operates within the governing United Socialist Party of Venezuela (PSUV). portrayed the current demonstrations as something that could force Maduro from office,” the American economist Mark Weisbrot reports. The cartography of protest in Caracas has closely mirrored the socio-geographic divisions of the capital, featuring as it does a lighter-skinned and richer east, and a darker-skinned and poorer west. Middle class barricades were erected in the east, populated by the students of elite private universities, alongside students of the main state university – historically, a cordoned off stomping ground for kids of the rich. The west, on the other hand, was relatively free of unrest. In the days following the initial explosion of activity, the “peaceful” protests of the Right included attacks on 50 of the public buses from a new system that acts as affordable transport for the poor. The Bolivarian University, a new institutional network designed to incorporate the lower orders into the higher education system, was also besieged. And Cuban medical personnel working for the Barrio Adentro health program have been the targets of fierce physical offensives. According to numerous observers, paramilitary shock troops are operating behind the cannon fodder of right-wing students in the streets. In protests that are supposedly driven in part by the scarcity of foodstuffs and other basic commodities available to the population, rightist militants had the audacity to attack government vehicles delivering precisely such products.Capriles, meanwhile, has been reluctant to join the call for demonstrations in the streets, and indeed has piously condemned excessive violence by protesters while hoping that popular memory has faded with sufficient rapidity to leave in the past his leading role in calling out protests that led to a dozen deaths last April. With Capriles there is always one hand discretely, cautiously maintaining its measure of the pulse of insurgent conspiracy. If that pulse grows sufficiently strong, he’ll abandon the path of negotiation. 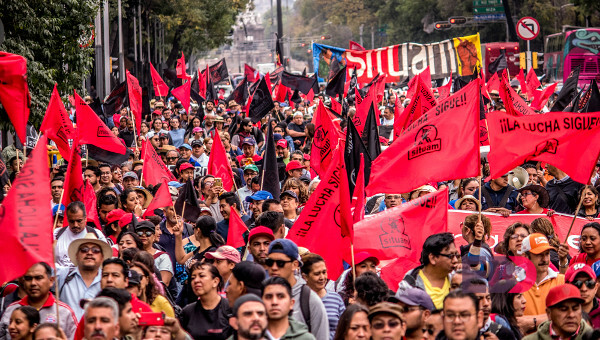 In another sign that the effects of aggressive student protests have thus far alienated moderate sections of the counter-revolutionary bloc, it seems that few political leaders on the Right of any importance – beyond López and Machado – have lent their formal backing to the violent posturing of student and paramilitary demonstrations. López, in state custody since February 17, and facing an array of charges related to sedition, is the most visible face of this third insurrectionary moment of the Venezuelan Right – the first being April 2002 and the second being the oil lockout of 2002-2003. He hardly emerged out of nowhere. López was the mayor of wealthy Chacao before Muchacho. After finishing prep school in the United States, he studied at the Kennedy School of Government at Harvard University in the 1990s, where he made contact with U.S. establishment figures such as David Petraeus, ex-chief of the Central Intelligence Agency and confidant of Barack Obama in all matters connected to national security. Back in 2002-2003, the counter-revolutionary bloc consisted mainly of the U.S. embassy in Caracas, the highest echelons of management of the state-oil company PDVSA, the business confederation Fedecámaras, the Central de Trabajadores de Venezuela (Venezuelan Workers Central, CTV), the domestic hierarchy of the Catholic Church, and a variety of other oligarchic and conservative cross-sections of political society. This ugly melange was prettified through the lens of private media empires, both national and international, transforming the coup attempt into a struggle of democracy against tyranny. Beginning in roughly 2008, the right-wing of the perennially divided student movement was sought out as a new vanguard through which to advance the opposition agenda. The counter-revolution had not enjoyed significant successes in linking organically to any other social subject that might otherwise have flag-shipped their enterprise. The large landowners and big business sectors that constitute their leadership are incapable of forging a national, unifying movement with the incorporation of wider social layers. The presence of the oppositional Right within the formal working-class is minimal, as is its influence among the popular sectors more generally, at least for now. It is thus understandable, within its own logic, why the Right has sought out the students as a field of struggle. In 2008, the U.S.-based Cato Institute awarded the $500,000 (U.S.) Milton Friedman Prize for Advancing Liberty to student leader Yon Goicoechea for his role in mobilizing protests against the government’s suspension of private broadcaster RCTV’s licence. Subsequently, a considerable chunk of the $45-million (U.S.) in annual funding from U.S. institutions to the Venezuelan opposition was directed toward “youth outreach” programs. If the students are the visible brigades tearing up the cityscapes, a complex configuration of national and transnational networks forms the counter-revolutionary bloc of the present. Fedecámaras remains active, as do the major players in private media, national and international. Political parties, NGOs, and churches are all articulated under the umbrella of MUD. In terms of parties, this fragile unity contains Acción Democrática (Democratic Action, AD); Primero Justicia (First Justice, PJ); COPEI, Causa Radical (Radical Cause, CR); Voluntad Popular (Popular Will, VP); Proyecto Venezuela (Project Venezuela, PV), and a series of other smaller entities of the Right. Among the multimillionaires backing the opposition is Pedro Carmona, often considered the father of golpismo (coupism) in Venezuela. Carmona was briefly declared President by coup supporters in the midst of their abortive attempt to oust Chávez in 2002. Exiled in Colombia at the moment, he is said to maintain a network of complicity in Venezuela. Jorge Roig is one of the businessmen of Carmona’s politicized network in Caracas, and Eligio Cedeño is a key contact in Miami. Both Roig and Cedeño are openly promoting economic boycott, shortage of goods, and hoarding at the moment. They are also alleged to have financed various golpista civil society groups, such as the NGO Humano y Libre (Human and Free). In the international sphere, U.S. institutions such as USAID and the National Endowment for Democracy (NED) have forged intimate ties with the right-wing opposition, providing logistical and financial support at every turn. The full extent of their involvement is unlikely to be known for several years, but through Wikileaks we know already a considerable amount. NGOs proliferate domestically in the shadows of other actors. Among them is the Centro de Divulgación del Conocimiento Económico para la Libertad (Centre for the Popularization of Economic Knowledge for Freedom, CEDICE). CEDICE generates sustained critique of the economic policy of the government and openly supports boycott campaigns. Among its most important financial backers is the U.S.-based Center for International Private Enterprise (CIPE). It is a widespread belief within Chavismo, and with good historical precedent, that the whole range of domestic actors on the Right are in regular communication with the Pentagon, CIA, and State Department in terms of determining the range of tactics to be deployed over the next period. Discontent among layers of the Chavista grassroots is real, with a second move to devalue the currency very recently being introduced in capitulation to demands from the Capriles “soft-Right” contingent. High inflation is destroying workers’ real salaries and makes virtually meaningless the recently decreed 10 per cent increase in salaries. The social base of Bolivarianism has long been calling for an iron fist in dealings with the bourgeoisie, but the Maduro government has restricted itself to ad hoc and ineffective controls, laws, sanctions, and a series of other measures that do not cohere into an economic strategy. It is very difficult to sustain the process even in its current state, never mind deepening and extending any long transition toward socialism, given the weight that private capital still enjoys in the economy. According to Sutherland, Venezuela experienced capital flight during the period of fixed exchange rates of around $150-billion (U.S.), the equivalent to approximately 43 per cent of GDP in 2010. This looting of capital is part of what is driving the devaluation of the local currency and strengthening speculation in the parallel black market in dollars (in which dollars are sold for 15 times the official exchange rate). The black market rate is the rate used by commercial vendors to set their prices, with the exception of the few products subject to regulation. So escalating prices, even setting aside the issue of hoarding, would still be a major issue requiring resolution. Those commercial actors who legally obtain dollars through official channels in order ostensibly to purchase imports of goods from abroad have no incentive to actually use the dollars obtained to this end; rather they have every incentive to divert those dollars illegally onto the black market in order to make extraordinary profits. This causes further scarcity of goods, increases in prices, and a fall in the quality of goods and services – i.e. it is less a conspiracy of capital through economic warfare, than its regular behaviour given incentive structures that is at the root of the present economic crisis. According to the communiqué of Marea Socialista – a group which has repeatedly declared its decisive commitment to defending the Maduro administration against any and all rightist conspiracies – the principal error of the government consists in its vacillation in economic policy since April 2013. The intervening period has witnessed the introduction of certain measures that can only be read as adaptations to demands from the Right. With the announcement the latest devaluation of the currency introduced earlier this month (called “SICAD 2”), which is similar to the system introduced in 2010 under Chávez, the government aims to free up an even more substantial part of the oil rent, the result of which will be even higher inflation. All of this, Marea Socialists warns, will deepen the crisis of scarcity. This announcement of a new Permuta dollar, embedded within the SICAD 2 arrangements, will achieve nothing but the deepening of social discontent and disorientation among the Chavista social base. hoarding, speculation, and contraband; a call for the peoples and governments of Latin America to lend support and solidarity through the supply of basic goods and medicines to confront the problems of the immediate moment and of the transition to the implementation of such measures. the Bolivarian process in an anti-capitalist direction. PDVSA and Vice President of the Economy, Rafael Rodríguez, but notes that there are others. According to Roland Denis, there are real divisions within the capitalist class that are partially being expressed through the visible tensions in the current leadership struggle for hegemony in the right-wing opposition. There is, according to Denis, a national section of the bourgeoisie that has enjoyed a “paradise of profits over the last number of years, operating beneath a model of bureaucratic-corporatism and the state capitalism promoted through the economic development plan of the government.” In this analysis, the rent captured through corruption and clientelist networks has generated profits for this national section of the bourgeoisie, just as it has for the internal bureaucratic layer of Chavismo identified in passing by González. As a result, the national section, represented politically by Capriles within the latest dispute on the Right, has not immediately lent its potential force (business strikes, open sabotage of the economy, internal coups, etc.) to the assault on power being orchestrated by López and Machado. Instead, the national section is interested in relative stability, and a regime transition which would not put into jeopardy the current paradise of profits. Some Chavista supporters, lacking such a critique of the bureaucratization of the process to date, offer an overly complacent view on the possibilities of resolving the present conflict. They point to the fact that, unlike in 2002, the Bolivarian forces are now much more consolidated. They control the oil rent which is obtained through the state oil company PDVSA. They control the armed forces and access to international reserves. And they have a much more prominent presence in the field of production and arena of the media. On its own, this is more a recipe for the consolidation of a bureaucratic state capitalism than a project of emancipatory socialism. A recent communiqué from the Corriente Revolucionario Bolívar y Zamora – Poder Popular Socialista (The Bolívar and Zamora Revolutionary Current – Socialist Popular Power) resonates more profoundly with the best impulses of the poor in their own struggles for liberation within the Bolivarian process of the last 15 years. The winds of reaction in Venezuela in 2002 and 2003 unintentionally instigated the richest phase of self-organization and activity of the oppressed and exploited that we have witnessed thus far in the course of the Bolivarian process. The question is whether the Left of Chavismo can win in the present conjuncture; can it put to rest all illusions fostered by the most conservative sections, and bureaucratized layers of the ruling party in any technocratic, negotiated “peace” with the “democratic” sections of the bourgeoisie. If the Chavista Left can manage this, it’s not impossible that transformative renewal and vitalization of the process generally would be the result. It’s on the table. It matters not just that this third insurrectionary moment of the counter-revolutionary Right is defeated, but how it is defeated, and that it is actually defeated. “ever greater opening of spaces to the people and not to assume that the people are merely a reserve bequeathed by the comandante [Chávez] that is available to be convoked in moments of risk or electoral conjunctures. It is necessary to free popular protagonism, its incipient power, popular power, the communal councils and communes, the collectives and social fronts, all of the enormous and marvelous diversity that if unleashed in full will be capable of storming heaven. Our biggest strength is the resonance of our ideas in the fertile soil of the grassroots – in political, cultural, ethnic, sexual, popular diversity. There we will find enormous concentrated energies. It’s with these people that the struggle will be won in the street, but also in the struggle of ideas, of values, of ethics and of aesthetics, as they push to fully realize their concrete, revolutionary, fulfillment. Concretely, this might mean, among other things, putting an end to the impunity of the Right – not just enforcing the full letter of the law against Leopoldo López, but calling for the detention of Capriles and all those responsible for the government supporters assassinated in April 2013 following the presidential elections. It might mean the incorporation of the grassroots into the highest levels of decision-making power in the government – that is, the inclusion of the social and political organizations of the Bolivarian people, their rank-and-file unions, and their communes and councils, as well as the endowment of these bodies with authentic power. It might mean the encouragement and support for the independent struggles of the exploited who are currently fighting for improvement in their salaries and for the defence of their jobs, as in the case of the auto workers, or for their collective contracts, as in the case of electrical workers – that is, the government must encourage, not criminalize, the legitimate, autonomous struggle of working people living from their labour even as it encounters the forces of counter-revolution, indeed to better its chances in this encounter. Such a redirection would also likely require the renovation of leadership circles and the bringing to justice of those in the highest offices of the state – judicial, legislative, and military – who have used their posts for enriching themselves, resulting in the consolidation of a bureaucratic layer within the regime. One place to start might be the renovation of the cabinet, beginning with the Ministry of the Economy. What of the reactivation of the commission for the transformation of the state, abandoned since 2003? It is also obvious to many that if a socialist transition out of the present crisis is desired, it will be necessary to establish a system of democratic planning, from below to above, from municipalities up to regions, with an immediate emphasis on restoring productive capacity, meeting the basic consumption needs of the population, and moving toward the socialization of the country’s economy. This article was written originally for New Politics. Roland Denis, “Desactivar el fascismo,” Aporrea , February 19, 2014. Accessed on February 23, 2014. Belen Fernandez, “Towards Another Coup in Venezuela?” Al Jazeera , February 19, 2014. Accessed February 25, 2014. Jake Johnson, “Venezuela: Who Are They and How Did They Die?” CEPR , February 23, 2014. Accessed February 25, 2014. John Kerry, “Situation in Venezuela,” U.S. Department of State, February 21, 2014. Accessed February 25, 2014. William Neuman, “Protests Swell in Venezuela as Places to Rally Disappear,” New York Times , February 20, 2014. Accessed February 25, 2014. Cited by Mark Weisbrot, “Does Venezuelan Television Provide Coverage That Opposes the Government?,” Centre for Economic and Policy Research, February 24, 2014. Accessed February 25, 2014. Julia Buxton, “Venezuela: The Real Significance of the Student Protests,” Latin American Bureau , February 20, 2014. Accessed on February 22, 2014. For the Occupy arrest figures see occupyarrests.moonfruit.com. Accessed on February 25, 2014. Gary Younge, “Open Season on Black Boys after a Verdict Like This,” Guardian , July 14, 2013. Accessed on February 25, 2014. Jeb Sprague and Joe Emersberger, “Impunity for Venezuela’s big landowners,” ALAI, December 20, 2011. Accessed on February 25, 2014. For a recent commentary on the Right’s record, see Mark Weisbrot, “U.S. Support for Regime Change in Venezuela is a Mistake,” Guardian , February 18, 2014. Accessed on February 21, 2014. Atilio Borón, “La amenaza fascista,” Rebelión , February 19, 2014. Accessed on February 21, 2014. See the illuminating discussion of these matters by Gregory Wilpert on The Real News Network , February 22, 2014. Accessed on February 23, 2014. Pedro Santander, “Diálogo o golpismo: Lo que está en juego en Venezuela,” Rebelión , February 19, 2014. Accessed on February 23, 2014. See Andrés Schipani, “Venezuela: Amid Unrest, Another Forex Mechanism,” Financial Times , February 20, 2014. Accessed on February 21, 2014. The figure of 56 per cent inflation cited in this article is also the standard figure reported in sources close to the government. Nicmer N. Evans, “Oposición dividida pero no desunida y ‘la salida’,” Rebelión , February 6, 2014. Accessed on February 21, 2014. Marea Socialista, “Rectificar y avanzar hacia la revolución económica: Para frenar la ofensiva de la derecha,” Rebelión , February 15, 2014. Accessed on February 21, 2014. Mark Weisbrot, “U.S. Support for Regime Change in Venezuela is a Mistake,” Guardian , February 18, 2014. Accessed on February 21, 2014. Although it is also true that the student movement has always been divided, and its left-wing has had at different historical moments a presence within the elite state universities as well. Mike González, “Is Venezuela Burning? A Letter from Caracas,” Revolutionary Socialism . Accessed on February 22, 2014. Quoted in Manuel Sutherland, “Siete apuntes sobre las protestas en Venezuela,” Aporrea , February 17, 2014. Accessed on February 22, 2014. Andrés Schipani, “Opposition Leader Detained in Venezuela,” Financial Times , February 18, 2014. Accessed on February 21, 2014. Ana Esther Ceceña, “Leopoldo López: Agente de la CIA, el golpe, guarimbas, Uribe y el fascism,” Herramienta . Accessed on February 22, 2014. Luciano Wexell Severo, “Golpe de Estado suave,” Rebelión , February 21, 2014. Accessed on February 21, 2014. Corriente Revolucionario Bolívar y Zamora – Poder Popular Socialista, “Momento y perspectivas: la nueva asonada contrarrevolucionaria,” Rebelión , February 19, 2014. Accessed on February 21, 2014. This paragraph draws on Julia Buxton, “The Real Significance of the Student Protests.” See also, Ana Navea, “Mentiras de la derecha para impulsar un golpe de Estado,” AVN , February 20, 2014. Accessed on February 21, 2014. Information in the last three paragraphs is drawn in part from Ricardo Martínez, “Los actores del golpismo en Venezuela,” RT Actualidad , February 18, 2014. Accessed on February 23, 2014. Susan Spronk and Jeffery R. Webber, “Sabaneta to Miraflores: The Afterlives of Hugo Chávez in Venezuela,” New Politics (Winter), 2014. Accessed on February 23, 2014. Andrés Schipani, “Venezuela: Amid Unrest, Another Forex Mechanism,” Financial Times , February 20, 2014. Accessed on February 21, 2014. Manuel Sutherland, “Siete apuntes sobre las protestas en Venezuela,” Aporrea , February 17, 2014. Accessed on February 22, 2014. George Ciccariello-Maher, “#LaSalida? Venezuela at a Crossroads,” The Nation , February 21, 2014. Accessed on February 23, 2014. González, “Is Venezuela Burning?” See also, Mike González, Hugo Chávez: Socialist for the Twenty-First Century , London: Pluto, 2014. Carlos Carcione, “El Proceso Bolivariano en la hora de verdad,” Rebelión , February 20, 2014. Accessed on February 21, 2014. This paragraph draws on proposals that conclude Denis’s extraordinary essay cited throughout this work.